After the bell peppers have undergone the fermentation process, they are thoroughly washed to rid the product of excess salt. Then they are placed on a work bench where they are stuffed by hand with a mixture of cheeses.The stuffed bell pepper with feta contains two components with great nutritional value. As the peppers undergo the natural fermentation process, they become rich in probiotics which help the intestines work better. It is a known fact that feta is rich in metals such as calcium, phosphorus and zinc and vitamins A, B2, B6. 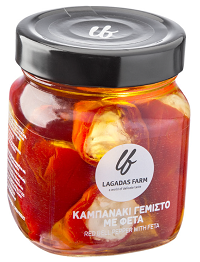 The red bell pepper with feta is a 100% Greek product. Note : Serving the product with a few drops of olive oil complements the taste. After opening keep in refrigerator (2-5 ° C) for 10 days. Storage Conditions Keep Out of the Sun, in a Cool, Dark Place.